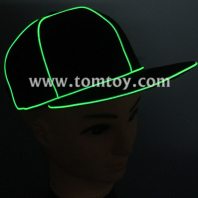 Fashion hat with tomtoy EL wire looks amazing during the day and at the night. It can remain bright for up to 12 hours with a new battery. Perfect for Concerts, Rave Festivals, Bars, Clubs, Electric glow run, LED parties, Halloween, Costume Parties, Mardi Gras, Carnivals, Gifts, and more.